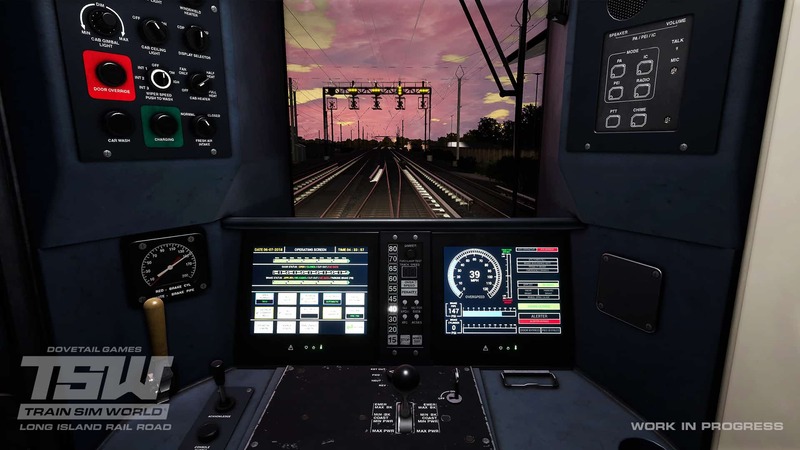 The Long Island Rail Road is soon coming to Train Sim World, initially to Windows PC – and the featured equipment with be LIRR’s remarkable electric workhorse, the Bombardier M7 EMU. 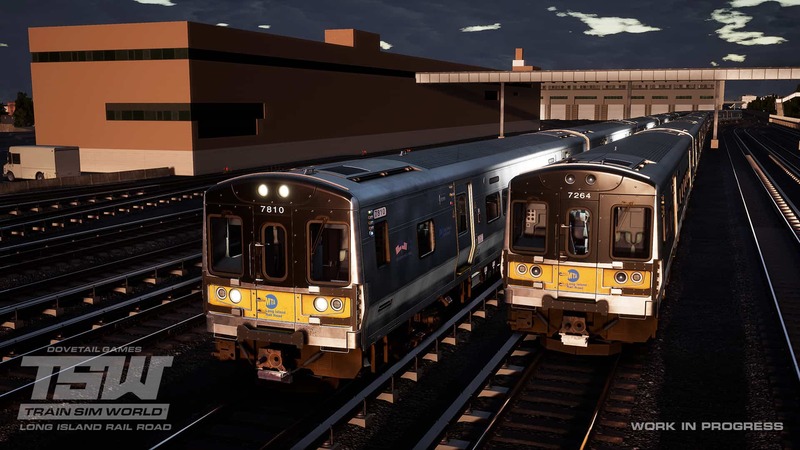 As announced in the recent Dovetail Live article “TSW + LIRR = 24/7 Railroading!”, America’s busiest commuter railroad is coming to Train Sim World and soon you’ll be climbing aboard the Long Island’s modern Bombardier-built M7 electric multiple units, of which the LIRR operates more than 800 examples! What can be considered the modern era of the Long Island Rail Road dates to the mid-1960s, when, after more than a half-century of control by the Pennsylvania Railroad, the LIRR was taken over by the Metropolitan Commuter Transport Authority in 1966, and then in 1968, by its present owner and operator, the Metropolitan Transport Authority (MTA). At the time MTA assumed control, LIRR’s fleet of EMUs were primarily of PRR-design (such as the classic, heavyweight MP54s) and long overdue for replacement. Under MTA, the electric commuter fleet of the LIRR was modernized, starting with the purchase of 770 M1 electric multiple units constructed by Budd in 1968-1974, and then supplemented by an additional 173 similar M3 EMUs in 1984-86. By the close of the 1990s, the LIRR’s Budd electrics were, in turn, coming due for replacement (as were sister M-series cars MTA had purchased for its other commuter railroad property, the Metro-North Commuter Railroad). Selected to supply the next era of EMU equipment was Bombardier. Designated the M7 class, the new electric multiple units would be modernized and enhanced editions of their M-series predecessors. MTA issued a contract in May 1999 for Bombardier to begin construction of what would eventually become a fleet of 836 M7s for the LIRR. Following testing and trials, the first M7s entered LIRR service in 2002. 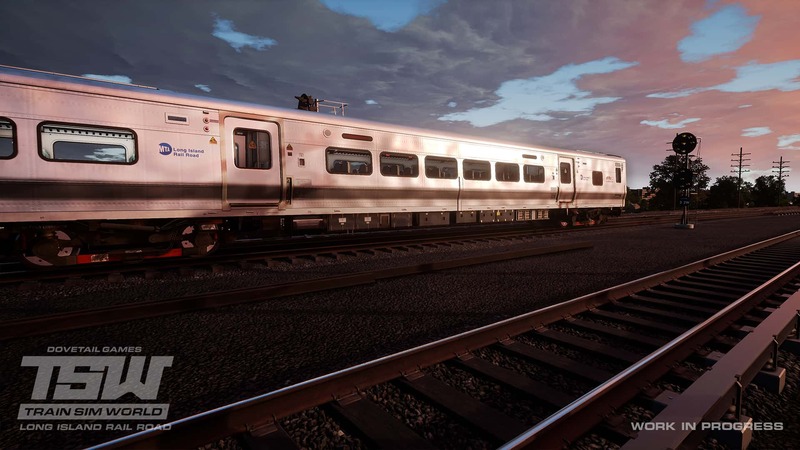 Of stainless-steel construction, the Bombardier M7s receive power via LIRR’s 750-volt DC third-rail and are equipped with asynchronous AC motors featuring IGBT inverters and ride upon outboard-bearing bolsterless fabricated trucks. The M7s employ traction motors each rated at 265 hp. Stretching 85-feet in length and weighing approximately 125,000 pounds per copy, the M7s were built in married pairs (with one car of each pair including a handicapped-assessible restroom). Each married pair has a capacity of 211 commuters and on the LIRR, the M7s typically operate in consists of eight and up to 12 cars in length facilitated by the cars’ “pin and cup” couplers. Maximum operating speed for the EMUs on the LIRR is 80 mph and the M7s are equipped with regenerative braking and in-cab signaling and safety systems. 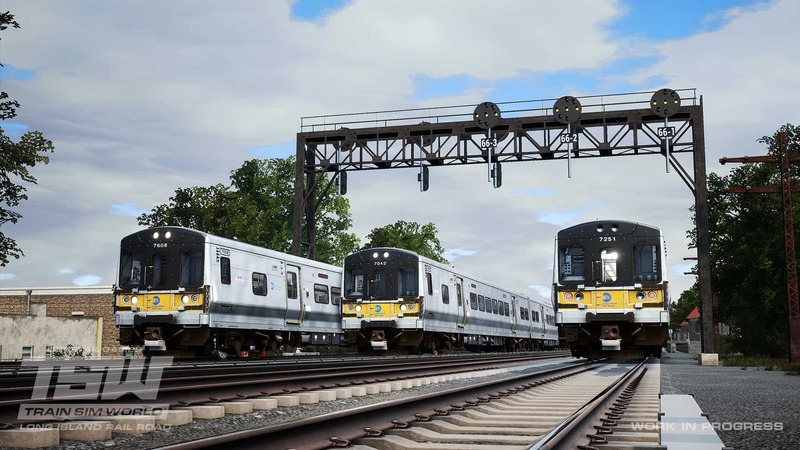 The Long Island Rail Road’s M7 EMUs (LIRR road numbers 7001-7836) are dressed in a stainless steel, yellow, and black livery. MTA sister railroad Metro-North Commuter Railroad operates more than 300 similar EMUs, the blue-liveried M7A, on its Hudson and Harlem lines, making the Bombardier “M7 family” of EMUs serving the New York City area total more than 1,100 units! For service on its non-electrified lines, the LIRR employs EMD-built DE30AC and DM30AC diesels and Kawasaki-built C3 bi-level cars. 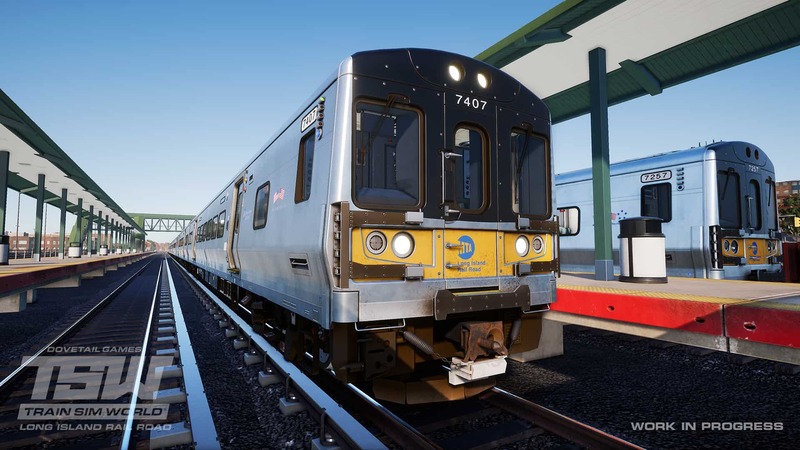 MTA’s newest generation of EMUs, the Kawasaki-built M9, is now in testing and it is anticipated a fleet of nearly 600 such EMUs will be in service on LIRR and Metro-North by 2020 or shortly thereafter. 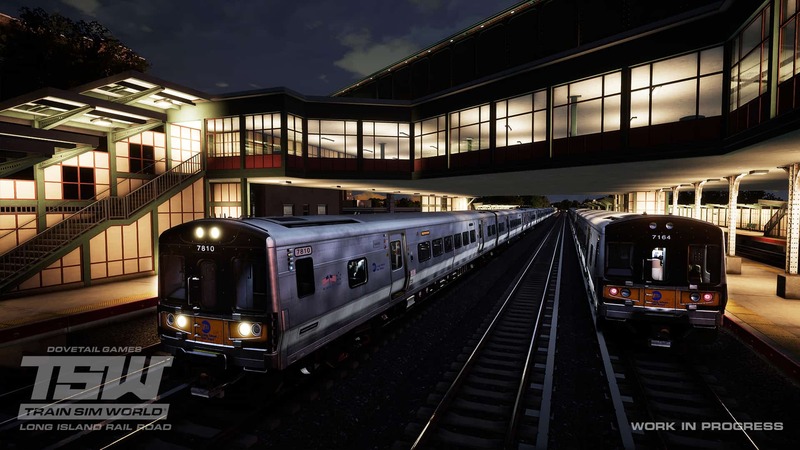 But there is no doubt the capable and ubiquitous M7, the present-day workhorse of the Long Island Rail Road, will see front-line services on “the Island” for many years to come. 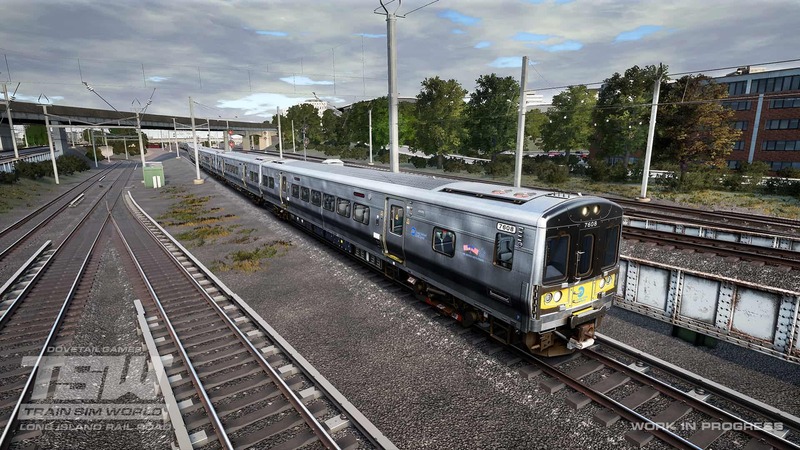 The Long Island Rail Road, America’s busiest commuter route, is coming soon to Train Sim World and the featured equipment on the always-bustling route will be LIRR’s electric workhorse – the Bombardier M7 EMU. The LIRR operates more than 800 M7s! Screenshots by Gary Dolzall. 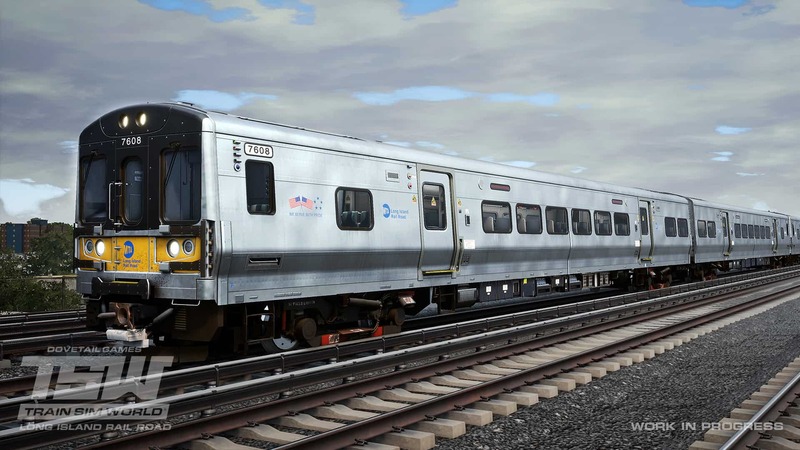 Of stainless-steel construction, the LIRR’s Bombardier M7s receive power via the railroad’s 750-volt DC third-rail and are equipped with asynchronous AC motors featuring IGBT inverters and ride upon outboard-bearing bolsterless fabricated trucks. Stretching 85-feet in length and weighing approximately 125,000 pounds per copy, the M7s were built in married pairs (with one car of each pair including a handicapped-assessible restroom). Each married pair has a capacity of 211 commuters. Note: Screenshots depict content in development. 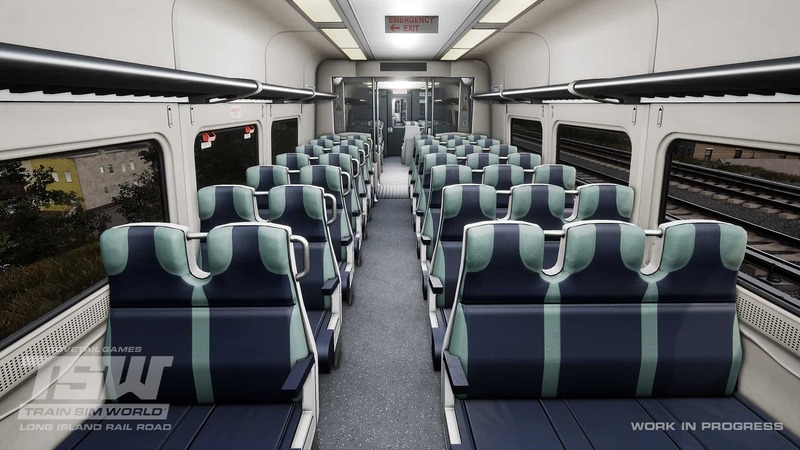 The upcoming LIRR M7s will be authentic in virtually every detail, including realistic controls (above), in-cab signal and safety systems, cold-start set-up and operating procedures, door control system, and complete coach interiors (below). At famed Jamaica, Long Island Railroad M7s ease up the station platforms (above) to handle some of the 310,000+ riders the LIRR serves each weekday. Located just east of Jamaica station is LIRR’s Hillside Maintenance Complex (below) which maintains the railroad’s fleet of 836 M7s. The sprawling Hillside facility was opened by LIRR in 1991. Westbound and destined for “the Big Apple,” LIRR M7 7608 leads the way through the complex spider web of trackage shared by LIRR and Amtrak near Harold Interlocking in Queens, New York. The Long Island Rail Road’s M7 EMUs (LIRR road numbers 7001-7836) typically operate in consists of eight to 12-cars and at speeds up to 80 mph. 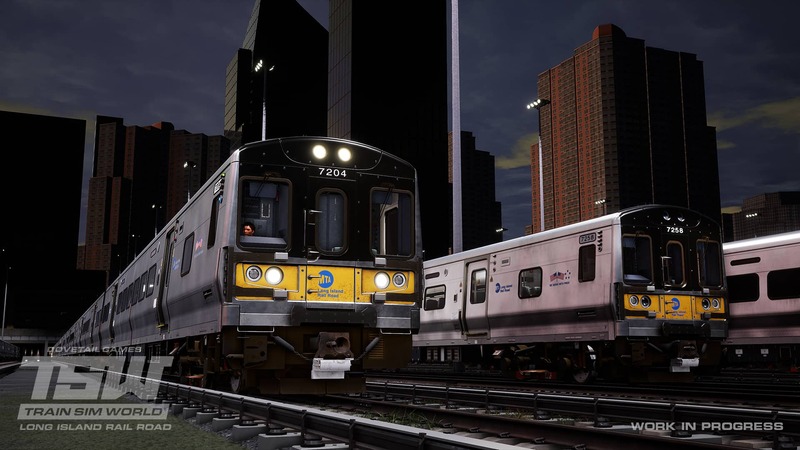 The upcoming Train Sim World LIRR route includes all three New York City terminals (Penn, Atlantic, and Long Island City) and extends east to Hicksville, New York (as well as featuring the Atlantic, Hempstead, and Belmont branches). Dawn has not yet broken, but the LIRR is already busy as east- and westbound M7s meet at the multi-level Woodside station (above). Later in the day, another pair of M7-equipped trains pass at Forest Hills (below). In total, the upcoming LIRR route includes 26 stations! At Hicksville, site of the junction between Long Island Rail Road’s Port Jefferson and Ronkonkoma lines and the eastern end of the upcoming LIRR TSW route, the last rays of a summer evening glint off the stylish stainless-steel sides of an LIRR M7. 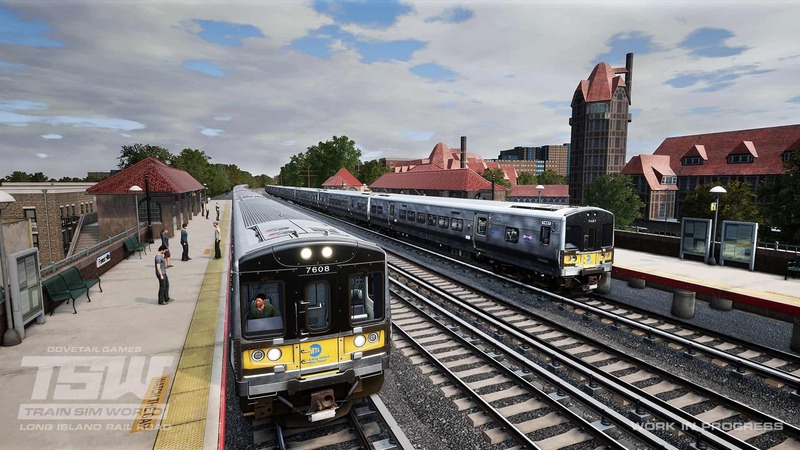 Train Sim World’s LIRR route will feature not only the railroad’s ever-busy main line, but also captivating branch line operations. At Hempstead station, terminus of the Hempstead Branch, M7s await their next call. 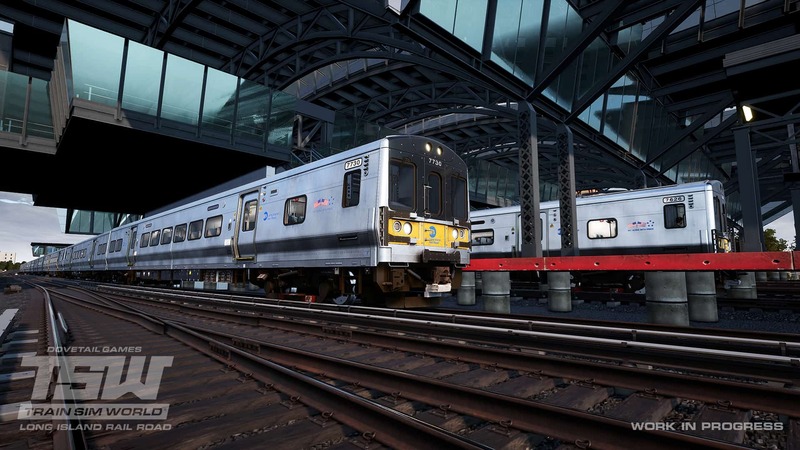 The LIRR route and the railroad’s workhorse electric – the Bombardier M7 EMU – are coming soon to Train Sim World!